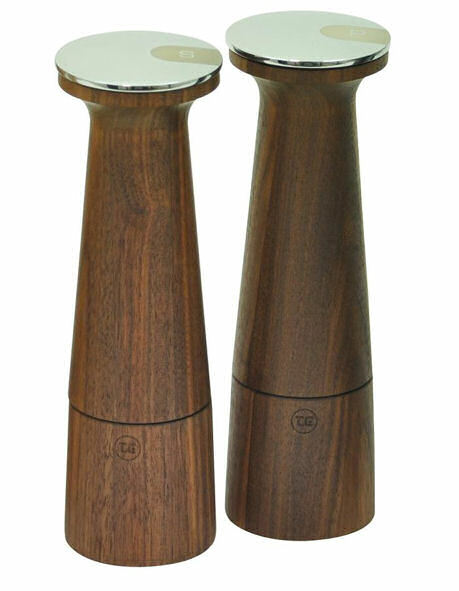 Stylish, sophisticated Salt mill in Black Walnut, definitely not, your normal run of the mills! Lovely to use, easy to fill and great gifts. More about TG Woodware Grinder ... a design classic and ideal for the kitchen or dining room, these mills contain the superior CrushGrind® ceramic mechanism which effortlessly grinds not only salt and pepper but also using the same grinder, whole dried herbs and spices, ideal for any budding gourmet. Click here to view. 25 year warranty on grinding mechanisim. The ceramic mechanism/grinder is fully adjustable with over 12 settings to grind from fine to coarse grain. In addition these mills are without spindle, making them easy to fill. T&G’s award winning CrushGrind® mechanism is the ideal choice as it allows you to effortlessly grind not only salt and pepper but also, using the same grinder whole dried herbs and spices. T&G truly believe in the importance of their mills, peppercorns like coffee beans taste best when freshly ground! Pepper freshly milled is clearly superior if you compare it to the ready ground varieties available from supermarkets. Whole peppercorns contain a natural oil which gives pepper its distinctive flavour and quickly oxidises and looses its pungency once the peppercorns are ground. For maximum eating pleasure the pepper is best ground coarsely so that the final grind is done with the teeth, releasing the pungent flavour direct into the mouth. Salt is an essential mineral component of a healthy balanced diet. Sea salt provides one of the simplest ways of meeting these dietary needs. As is the case with ready ground pepper, processed table salts are considered the least flavoursome by discerning cooks. This is because they often contain additives and anti-caking agents to provide easy flow. For these reasons salt and pepper mills are among the most popular kitchen tools! CrushGrind® Mills all have the CrushGrind® ceramic mechanism which achieves a finer grind than conventional metal mechanisms. Furthermore because this type of ceramic is an extremely tough material it guarantees excellent ongoing performance for many years. CrushGrind® mechanism has its own unique grinding system which requires no central spindle and delivers excellent performance grind after grind. CrushGrind® is excellent for grinding dried herbs and spices which quickly lose both aroma and flavour once they are ground, because the essential oils very quickly evaporate. Buying coarsely ground dried seasonings and milling them when required releases the essential oils, restoring smell and taste to the level of fresh picked ones. CrushGrind® is easy to use, simple to fill and regulated by a simple rotating wheel at the base of the mill to achieve a fine or coarse grind. Proven performance; test results established the mill in perfect working order after grinding 50 kilos of pepper and 50 kilos of salt through the same grinder – the equivalent of 400 years of normal domestic usage. The mechanism can easily be removed making it ideal for cleaning and maintenance. As the mechanism is ceramic, it is also non-corrosive and non-porous and unlike metal it will not oxidise food – making it more hygienic.